From the homepage ads, it is easy to recognize that Fasttech.com currently focuses more on offering cool electronic gadget accessories though it also carries cool gadgets like mini tablets or Android cell phones. From this perspective, it is very similar to Miniinthebox.com, another famous Chinese electronic accessory store. After checking its catalogs one by one, I realize that it is a truly online shopping mall for mobile phone and tablet PC accessories. There you can find any type of accessories for world top brands like Apple. For instance, the typical accessories for Apple there include protective cases, covers, skins and armbands, earbuds & earphones, cables & chargers, DIY parts & tools, holders & stands, stylus & touching gloves, screen protectors, attachments & docks, USB chargers, speakers and more. Every product looks unbelievably cool both in appearance and in pricing. It has a number of novelty cases and stands for iPhone 5 which are really adorable. I don’t need to compare prices offered by Fasttech carefully before I make the conclusion that its prices are very competitive. I’ve been doing research on Chinese online stores since 2009 and am quite familiar with the pricing policies adopted by various companies. 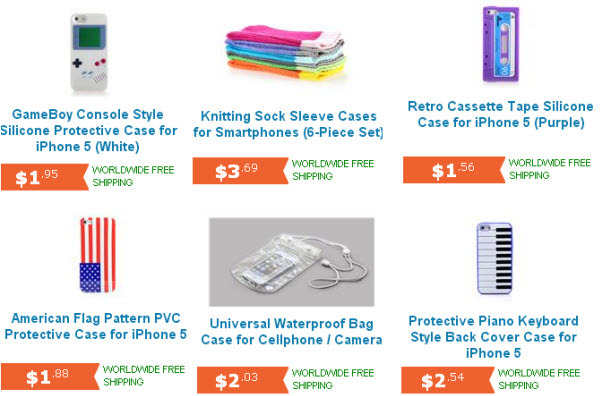 Just give a quick look at its cases and armbands for iDevices and you will be shocked to find how cheap they are. Some are even available at under $1 plus free shipping! At Fasttech.com, all orders (including drop-shipping orders) of whatever size are shipped via Airmail free of charge to any destination of the world. Very large orders will be upgraded to Speedpost Global Express and you don’t need to pay any shipping fee, either. It is a bit annoying that Fasttech does not indicate an official customer contact email and you have to register an account there before asking its customer team any pre-sales questions. After you open an account there (which takes seconds to finish though), you can send inquiries to its service people and they promise they will respond in 1 business day. The quickest way to reach Fasttech customer support is to call them at +1 (845) 262-3440 during their office hours: Monday to Friday, 9:30am to 4:30pm Hong Kong Time. If you are interested in shopping with Fasttech.com, visit the site here.